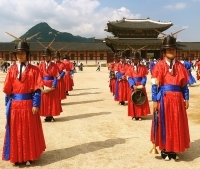 At Daehanmun Gate outside Deoksusung Palace, visitors can watch the ceremonial Changing of the Palace Guard three times every day at 11am, 2pm, and 3.30pm. Each Changing of the Guard ceremony takes about 30 minutes. Other highlights include a guard patrol ceremony held from Deoksugung to Sungryemun, and the Watchman Ceremony at the latter. These regal events are a must-see and provide a good opportunity to see the national military costumes and regalia. Venue: Sungryemun, Daehanmun and Deoksusung Palace.